I honestly didn't meld these two topics to make a clever post title -- it happened quite organically. Yesterday the IT guy here at work, while trying to fix something no less, inadvertently deleted my entire e-mail inbox, as well as my trash bin and all sent items. Not good, right? Well, I should also mention that I am a saver. There were messages dating back more than THREE YEARS to my first day on the job. Yikes. Yes, I do end up completely deleting many useless e-mails, and I try to maintain my inbox with about 50 semi-important top-of-mind messages, but everything in between was neatly tucked away in my "trash" folder. WAS. And all my sent messages lost in space. That may be the greatest loss, because sent messages come in handy when a manager or co-worker claims you never e-mailed them about subject X. Oh ya? Ta-da! Here's your proof, I rest my case. Or say you accidentally deleted a message from your friend with her new e-mail address in it. I'll just find my reply to her and the new address is recovered. Not any more. It's difficult to explain how weird I feel about this, and no doubt many of you have had similar experiences. It is sort of like that phantom limb syndrome, where you keep looking down to touch a body part that's no longer there. Willingly purging yourself of superfluous objects feels good; having them taken from you helplessly? Ugh. I know it's not a big deal in the grand scheme of things -- they're just words, afterall. But all the same, it feels exceedingly odd and wrong. 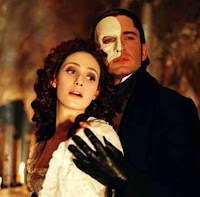 In other more pleasant news, I finally got around to watching "The Phantom of the Opera" motion picture this week. I meant to when it was released three years ago, but inexplicably never did. If you've not had the pleasure, I highly recommend you check it out. I'm not one of the fortunate souls who's been granted an opportunity to see the live stage production, so I won't pretend to know how it compares. But I've been a lover of the London soundtrack for years, just like a zillion other people around the world. So as far as flat-out movies go, this one is simply gorgeous. The visuals are lush. And the singing isn't bad either. Of course matching Brightman and Crawford is virtually impossible, but Rossum and Butler are suitable for a movie version. Speaking of which, the casting was quite good. Then-relative newcomers Emmy Rossum and Gerard Butler light up the screen. And I must say that despite his not being an exceptional vocalist, Butler is a formidable phantom and holds his own with a youthful injection of brooding passion. Who knew? The story is timeless and poignant on so many levels -- beautiful and gut-wrenching. And the music in this production always amazes me. Andrew Lloyd Webber so deftly weaves the refrains of all the songs together so one can unexpectedly juxtapose itself after another, and it's the most natural thing in the world. Nothing short of genius. And thankfully his close involvement with the film shows through beside Joel Schumacher's masterful directing. But alas, my copy of the soundtrack is nowhere to be found, so I'll have to get my fix today by singing the score to myself. Where's an angel of music when you need one? Hi there -- sorry I'm posting this right here (couldn't find your e-mail address). I have been deeply inspired by your blog and now have started to write my own. I would be happy to have a few regular readers and therefore ask you if we could do a "link exchange"? Please let me know whether you are interested. I live in Switzerland and am excited to find out if I can join the English speaking bloggers' community. Delete this post by the time you've read it.